Over the next few weeks I'm going to be posting some of my favorite beer recipes that for one reason or another never made it onto the blog. In addition, a few days ago I posted a Homebrew Recipe link page that includes a list of the approximately 75 homebrew recipes that I have posted so far. Each entry has a link to the recipe post. My plan is to keep it up to date by adding links whenever I post a new recipe. I thought to mark five years of homebrewing (as of February 8th) I would start by posting the recipe that started it all, Old Brown Sock (a reference to the color of the grain sock). This was a recipe my friend Nicole and I came up with for a student taught course (Beer Brewing and Appreciation) that we were taking as seniors at CMU. It is somewhere between an American Brown and an English Brown (American yeast and English hops). I was surprised how well it turned out for a first batch, but who knows how it would taste to me now if I brewed it again with the same mistakes (fermented too warm, low pitching rate, tiny boil, slow chilling etc...). I think this is a good recipe for a first batch since it is simple, and pretty middle of the road in terms of color and alcohol. 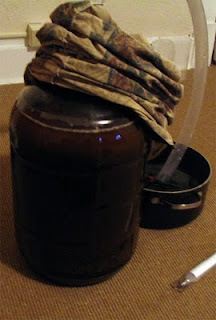 I'd be interested to hear comments about what other people brewed for their first batch and how it turned out. The label was designed by my friend Evan, who in the last few days has become a bit of an internet mini-celebrity in his own right for his creative counter-protest signs against the bigoted Westboro Baptist Church. 2.00 oz. Fuggle (Pellet 4.70% AA) @ 60 min. 0.50 oz. Fuggle (Pellet 4.70% AA) @ 5 min. What can I say? It was was my first batch. Probably fermented too warm, but it came out tasting great, if a bit over-carbonated. Tasted a bit like Newcastle, should repeat at some point, just a solid session beer. Stuck at home during the storm eh? Me too. Plenty of beer on tap though, so no problems in that department. How did you guess? Just bottled my butternut squash sour (dry hopped a six pack with a blend of simcoe and citra). )If I have tomorrow off I've got no choice but to brew a bitter. I'd still love to brew, but the fire escape has about 15" of snow on it. Just bottled my Funky stout yesterday, OG still a 1.026; very balanced acid and sweetness though. Hope you guys stay safe & warm during the storm out there. We get it often enough in WI that the foot+ of snow here yesterday wasn't that big a deal. From talking to friends out on the east coast though, it sounds like things were/are a mess. We shoveled out a little section of driveway and fired up the kettle here to brew a red wheat saison, but bottling inside where it's warm sounds like a smarter idea! Thanks for posting the catalog of all your recipes - that's a great resource to refer back to!! Sour Squash was also on the high side (1.012) but not nearly as high as your stout. Luckily I can brew inside if I need to (my boil kettle stretches over two burners). JW, glad you enjoy that recipe page, with a blog it is so hard to sift through posts from years back that it seemed like a good addition, plus the snow gave me the time to put it together. Enjoyed reading about your first brew. Cheers on 5 years and counting...I hope to still gong strong 3 years from now. My first brew was an Enlish-style ESB. It turned out better than expected. Tasted a little weak sauce, but my friends said they enjoyed it (I trust their feedback). Awesome link to your recipes...I might try and pull one off if you don't mind. My first brew with a friend was an all grain porter, I think the recipe was out of Dave Miller's book. It turned out really great, thanks to his experience. My first batch was a chocolate stout. It came out pretty good, but knowing what I know now, I'd never brew that recipe again. I spent weeks looking for "chocolate stout" recipes online instead of just approaching it as a stout I would add chocolate to. I used dark malt extract. A couple of my friends held onto their bottles of it. I got to drink one of them a few months back, and it was still decent. The other friend still has his. My first one was a brown ale kit with dry yeast. It ended up tasting fine, but I was paranoid about exploding bottles so I used under half the provided priming sugar. The result was almost completely flat beer. I remember trying to pour it standing on a footstool into a glass on the floor to try and coax a head out of it. Actually, the second batch I did, after resolving it'd be fine if I just used the correct amount of priming sugar, was that same goofy porter recipe that Seanywonton mentioned! It also got infected and ended up terrible. It was years before I tried again, but everything from then on has been great! Sounds like mostly positive experiences, I wonder if as jaymo mentioned people with really terrible first batches don't jump into the hobby like those who get a taste of success. For me it's more of a cashflow issues rather than a bad batch. I've had a couple that don't turn out "good," but you need those from time to time to build on...right? I've never brewed the same beer twice and I want to so I can perfect it and make it the best I can. How many of you have brewed the same beer twice and did you notice a difference in quality? I have brewed similar beers, but never the exact same recipe. I always feel like there is something for me to improve on. Certainly something I'll get around to some day when I really "perfect" some recipe. I'm just about to brew a similar beer but sort of the reverse - American Hops and a British ale yeast. It is an attempt at replicating the Brown Ale from Legend Brewery, a local brewpub/microbrewery. Good luck! I used to get Legend once in awhile when I lived down in Arlington, surprisingly they don't make it to DC much.